The DataMan 300 and 500 series of readers are our most advanced fixed-mount readers to date providing the highest read rates possible. Both are able to decode the most challenging 1-D and 2-D barcodes with enhanced 1DMax+ and 2DMax+ code-reading algorithms. With the addition of Hotbars technology, these readers can also achieve higher read rates of damaged 1-D linear barcodes at a faster pace than ever before. They also offer various optics options including liquid lens variable focus technology for maximum depth of field flexibility. The high performance DataMan 500 fixed-mount barcode reader is powered by a proprietary vision chip technology, Cognex VSoC™ (Vision System on a Chip), providing unmatched barcode reading and ease of use not found in other image-based or laser systems available today. 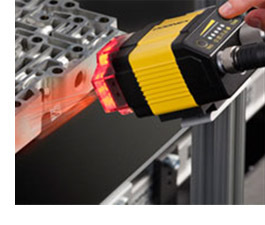 The DataMan 300/360 series of readers was developed to handle the most difficult-to-read DPM (Direct Part Mark) codes as well as challenging 1-D barcodes and 2-D Data Matrix codes for indexed or high speed lines.